West of Crummock Water and Grasmoor, between Coledale Hause and Wandope Moss. Grid ref: NY186204. Partly Public footpath and partly Open Access land. The path is used as part of a number of circular walks from both the Buttermere and Newlands valleys. 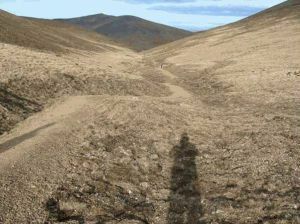 The path was barely visible on the ground in the late 1980s, and when surveys were completed in the early 1990s it looked like a route just trodden by sheep. Coledale Hause used to have the deepest path erosion scar in the Lake District. Rainwater gathered in the path trays on Crag Hill and Grasmoor, cascaded down the path and stripped out many thousands of tonnes of material. This altered the beck’s course and caused widespread damage. Trampling was also damaging vulnerable vegetation further up the slope as people tried to avoid the worst eroded areas. The water damage was stopped by installing drainage features and altering the path trays on Crag Hill and Grasmoor. A digger was used to turn the soil so that harder subsoil material was on top, creating a ‘soil inversion’ path with a welcoming walking surface. This was important to stop users walking beside the path and trampling the vegetation. A turfed drain was installed alongside the path so that water would drain away slowly without causing further damage. The area was then reprofiled to fill in the massive erosion scar, to further reduce the risk of water damage, and to make the area look as natural as possible. 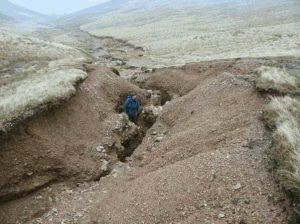 The repair work was completed at the same time as the route from Force Crag Mine to Coledale Hause, which used the same technique. A digger turned the soil over so no extra material was needed for the path surface. A small amount of stone from the surrounding area was used for the drainage features. Turf from the new path line was used to vegetate the drain alongside the path and the whole area was seeded to help bind the work together. Northern team and McClarteys of Crief (contractors).